I’m so glad I finally got around to switching out my seasonal clothes last week because it was only 32 degrees this morning when I walked the dog and will be a balmy 37-40 all day today. Brrrr! Although I have more overall storage in the new house, I have less bedroom/clothes closet space than I used to. So I’ve been storing out-of-season items so I can better utilize the space I do have. Do all your current laundry. Laugh if you want, but this simple first step will save you the later annoyance for having to drag out the ladder/schlep more items to the basement/etc. to add more items to your already tucked away storage boxes. 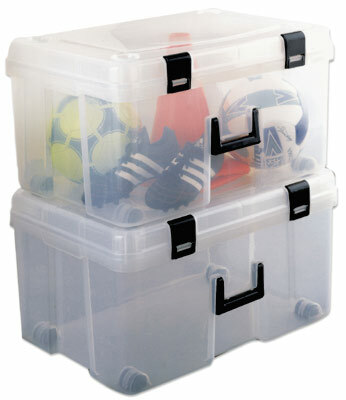 Have medium, airtight, plastic storage containers on hand. I like clear ones so you can actually see what’s inside. Don’t go too big – clothes and shoes can get heavy. Or, if your only storage option is under the bed, or you are worried about moisture, invest in vacuum-seal storage bags that air-seal. If you are swapping out stuff already in storage, dump it all out next to your dryer and use those same containers. You’ll want to spin all your storage stuff in a quick “refresh” cycle before you put it back in your closet anyway – but you do that last. Clear off a large space (the entire bed, or all your floor space) as your “decision drop depot” and set out a couple of empty containers that you can quickly toss stuff into. Bag up all of your give away and throw away items and get them out of the way. Less stuff to think about. Yay! Now take everything from the store pile and set it all out by category first, before you pack them. I pile up all of my shirts, jackets, pants, pjs, work-out clothes, and shoes separately, and then pack like items together. Now you have lots of room to put away all those “refreshed” clothes in your closet for this season! (Or shop to fill in the gaps – LOL!). This entry was posted on Friday, October 29th, 2010 at 5:30 PM and is filed under Organization. You can follow any responses to this entry through the RSS 2.0 feed. You can leave a response, or trackback from your own site.